Model 5012 -- easy to use. VICOM has announced the new wideband power sensor, Model 5012 from Bird Electronic Corporation, a designer and manufacturer of high-quality, test and measurement products, antenna and cable testers, power termination products, and other RF devices. The Model 5012 is an easy to use, multifunctional, directional power sensor that measures both forward and reflected power at frequencies ranging from 350 MHz - 4 GHz. The wideband power sensor is a power measurement product that can measure true average power, peak power, burst power, VSWR, CCDF, crest factor (peak to average ratio) and return loss match. The Model 5012 is an accessory for the Model 5000 DPM-EX (the newest edition of the Bird digital power meter series) and the Bird site analyser series. The new model is elementless, therefore the traditional plug-in elements used in the past, are no longer required to measure power. It directly connects to a PC, digital power meter or site analyser. 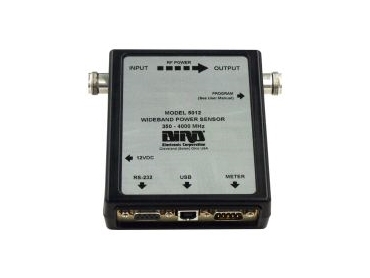 * Direct connection to PC, digital power meter or site analyser. * Handles >10dB peak to average power ratio. * 30dB directivity up to 3GHz; 28dB up to 4GHz. * Directional - forward and reflected power. When combined with a digital power meter, site analyser family of line and antenna analysis products or a personal computer, the wideband power sensor becomes an integral part of a very robust and sophisticated power measurement solution, spanning a large range of frequencies from 350MHz to 4000MHz.